150 mm Solar Newton - Page 2 - SolarChat! Bart, the idea of removing the coating of the secondary, or of having an MCM-like coating on the secondary, is not a good idea. This is because the secondary mirror support would get all the heat load. There would be no mechanical problem. This is just you will have the equivalent of a 40 Watts heater (for a 200 mm aperture) just in front the focus. The seeing would be awfull. On the other hand, having a 200 mm primary mirror coated by MCM (Ha + CaK) would be OK. The only issue is to gather a group of four 200 mm mirrors to fill the coating chamber. Hi Christian, thanks, I understand what you mean. But does the same problem not occur when you mount the Baader Blue just before the secondary? I read somewhere that MCM can go up to 250mm, that is the reason the mirror I will be making this winter will be a 250mm f/6. But the idea of 4 20cm mirrors is very interesting. Good luck with the experiment! The blue Astronomik filter transmits about 20% of incident energy and reflects the other 80%. So, for a 300 mm diameter, it means 20% x 100 W = 20 W going to the secondary. The secondary reflects 90% of energy. It means that 20 x 0.9 = 1.8 W heats the secondary mirror support. This is not a big deal. If you are interested, I can get you in touch with other people for a CaK/Ha coating. Drop me a personal message. A nice spot in the last couple of days, but no time to image. So tonight, while watching soccer (Netherlands vs Germany), tweaked the Newton a bit. - Changed the little allen screws (to collimate the secondary) for simple M4 screws. Why on earth do they use these small screws in the first place? - From a plastic milk carton I cut two small discs that rest on the secondary mirror holder. The central screw of the secondary hold them in place, the M4 screws don't touch the aluminium anymore, but the plastic discs. This way the collimation is much more accurate. - Tweaked the focuser a bit so now it does not operate so stiff anymore. - Wrapped the scope in radiator foil. Did that a long time ago with my Intes for night time use, now this one also looks like a silver tube. Earlier today I made a drawing for a Serrurier Truss version in wood. Really simple. 4 22x22 bars, some 9 mm triplex and 4 mm aircraft plywood. But first try this version. So. The scope is ready, the sun is bald and we lost in the last minute or so. [Edit] Ken corrected me, and he was right. The drawing I made was not a Serrurier Truss, but an open truss design, less complicated than the Serrurier Truss version. First light yesterday! Terrible seeing, did not use the SSM because I just wanted to try everything out quickly. The original focuser is even more terrible than I thought, so changed it for a 2 inch focuser that I had bought for a future project. That was a major improvement. Anyhow: gain 94, gamma neutral, 6,9ms. Stacked 50 images. That is a bit low, but with 100 and 150 images the result was worse. So a lot of noise, and a lot of improvement possible. Now waiting for a day with better seeing. First light is always exciting!! Well done for getting reasonable result. The first light CaK looks good Bart...well done!!! Seems to be working well Bart! Hoping to find out the potential with better seeing and curious how big the negative effect of the original tube will be. The first light seems promising, Bart. However looking at the full res image I see lot of noise, I think you should try stacking more images in better seeing conditions or to use a weak focal reducer to gain brightness. By placing a common 0.5x eyepiece reducer very close to the sensor, for example, it would work around 0.8x and should allow to reach focus even in your newtonian. This would require some adaption but it should be feasible. 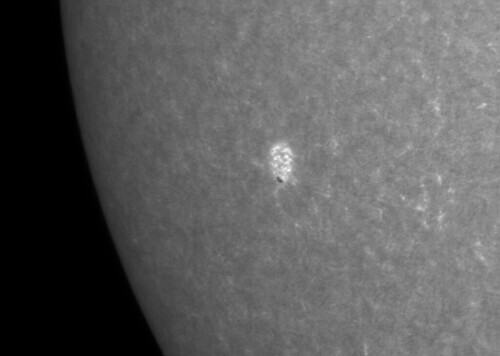 Anyway I have found that my solar newtonian is most useful for imaging in the K-line with the Baader filter and in the G-line with the Andover filter, in these domains high resolution work is really possible when seeing cooperates. I agree with what you say Raf: a lot of noise. Will keep experimenting! Really cool Bart, I look forward to seeing how this progresses. Any thoughts on transmission with that CaK filter? I'm curious how this would perform for high resolution CaK imaging in terms of keeping a high transmission compared to a 6" achromatic refractor with an ERF? 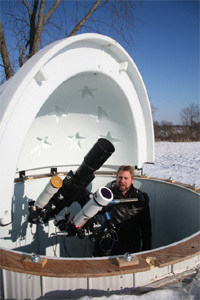 You start off with about 4% of the light, so that is the big disadvantage for the stripped Newton compared to a 6 inch refractor with a Tri-Band Erf. If I were you I would go for a 150mm Newton, don't strip the mirror, but install the Tri-Band Erf on the front. That's what I was wondering in general. I would imagine this is a great way to go for g-band imaging. I wondered if it would have enough transmission for something more narrowband. But as you pointed out, 4% transmission means likely not, at least, unless we're able to image with smaller pixels and a faster focal-ratio to match at a good sampling for the pixels. I was curious for the sake of an 8 inch parabolic newt. Not sure whether this is relevant information : uncoated primary mirrors (4% reflection) are quite appropriated for G-band (FWHM = 2nm) and K-line (FHWM 8 to 10 nm) imaging. However, for Ca K imaging (< 0.3 nm FWHM), the exposure time becomes too long.